Early Friday, 12 people were killed and dozens more were injured after a suspect opened fire at a midnight Dark Knight Rises screening outside Denver. 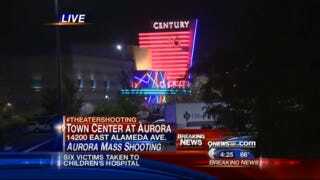 Colorado NBC affiliate 9 News is reporting that 12 were killed—ten of which died in the movie theater. Over seventy people were shot in total. The shooting happened in a movie theater in Aurora, Colorado, which is a Denver suburb. Tear gas was set off in the theater, followed by gunfire. Some theatergoers thought they heard firecrackers or that the gunshots were part of the movie. Some of the bullets apparently injured theatergoers in an adjacent theater. The gunfire has been described as "fully automatic." According to witnesses, the suspect entered the theater through the emergency exit, didn't say anything, and fired in the air. He then began making his way up the aisle and shooting audience members, including children. Reports state that the man wore a bulletproof vest, goggles, and a riot helmet. Authorities discovered the suspect in the parking lot. He had four weapons (an assault rifle, a shotgun and two handguns), and there were apparently more weapons and explosives in his car. The suspect is currently in custody, and police do not believe there was a second shooter. The Los Angeles Times is reporting that the suspect is a 24-year-old white male named James Holmes. Alleged cell phone footage of the aftermath shows patrons leaving the theater, including theatergoers cosplaying as Batman and others who look to be injured. Some might find the imagery disturbing. Note: This post was updated as new broke and was confirmed.